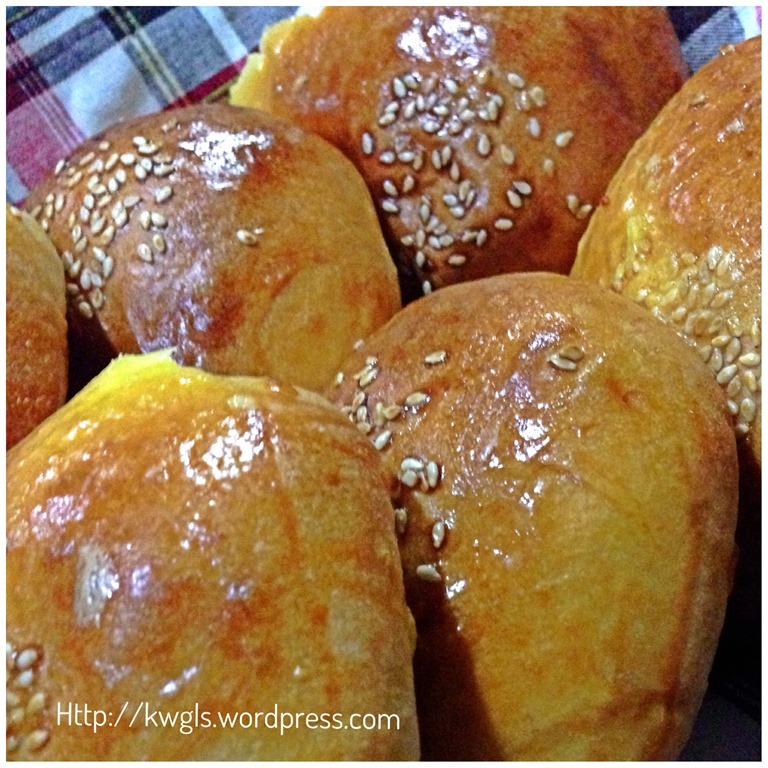 This is a post on breakfast soft buns making. 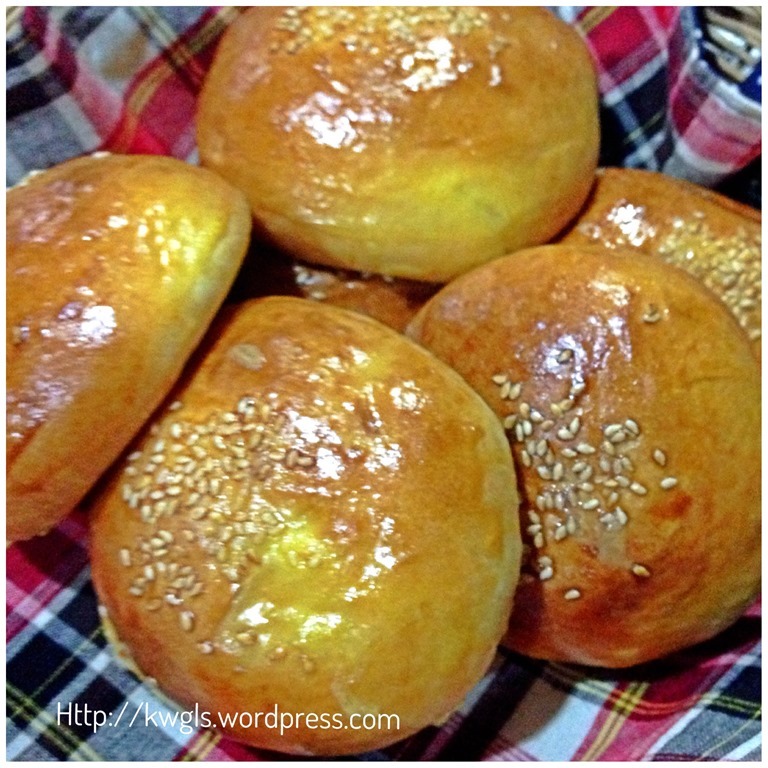 In Asia, it is rather common that breakfasts were served with soft, fluffy light buns. They can either be plain or with fillings. 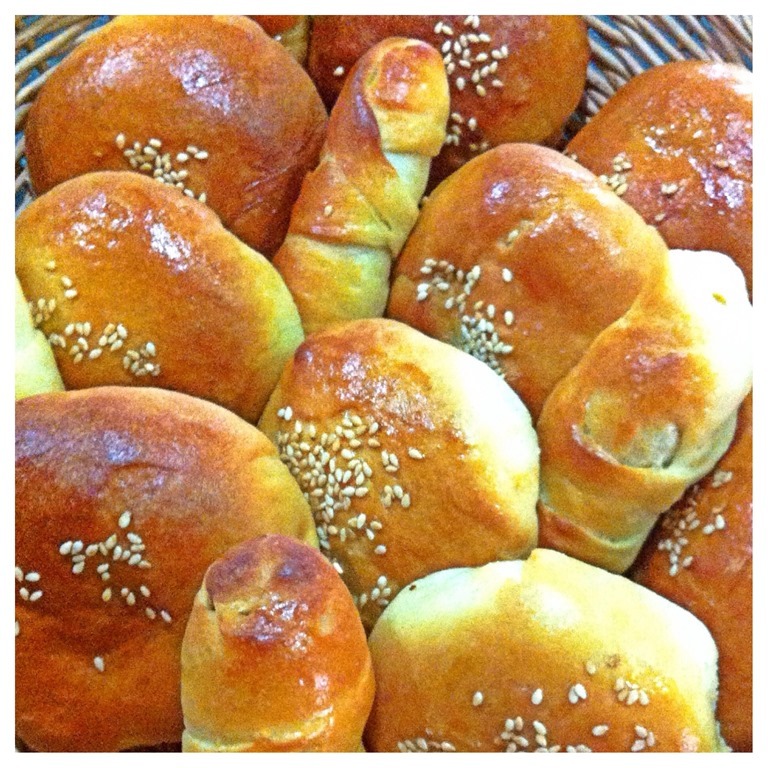 Since my wife have prepared some Kimchee two day’s ago, I have decided to prepare some Kimchee buns. You can know how to make the Kimchee HERE. 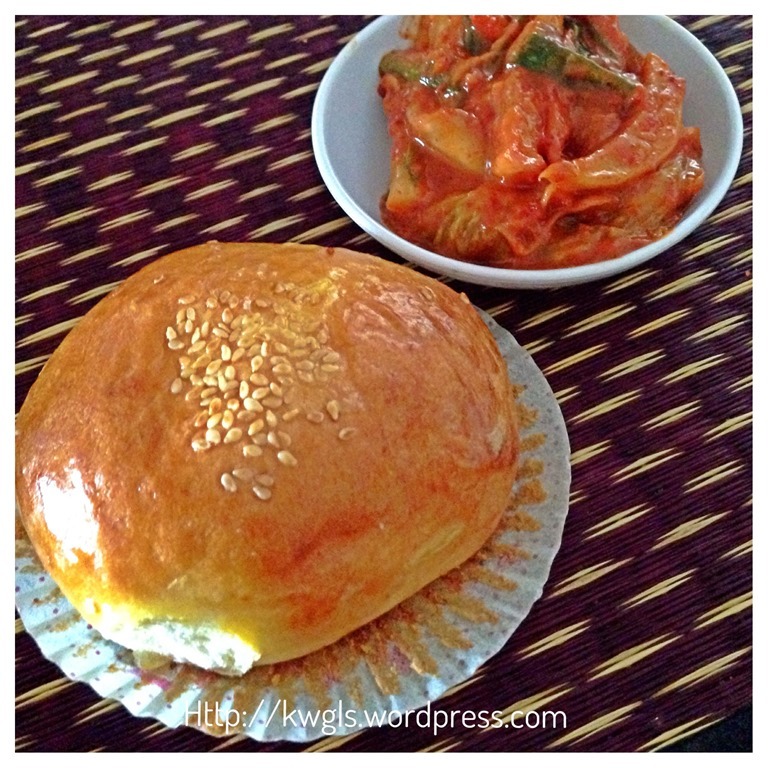 The sour and spicy kimchee blends relatively well with the plain buns. 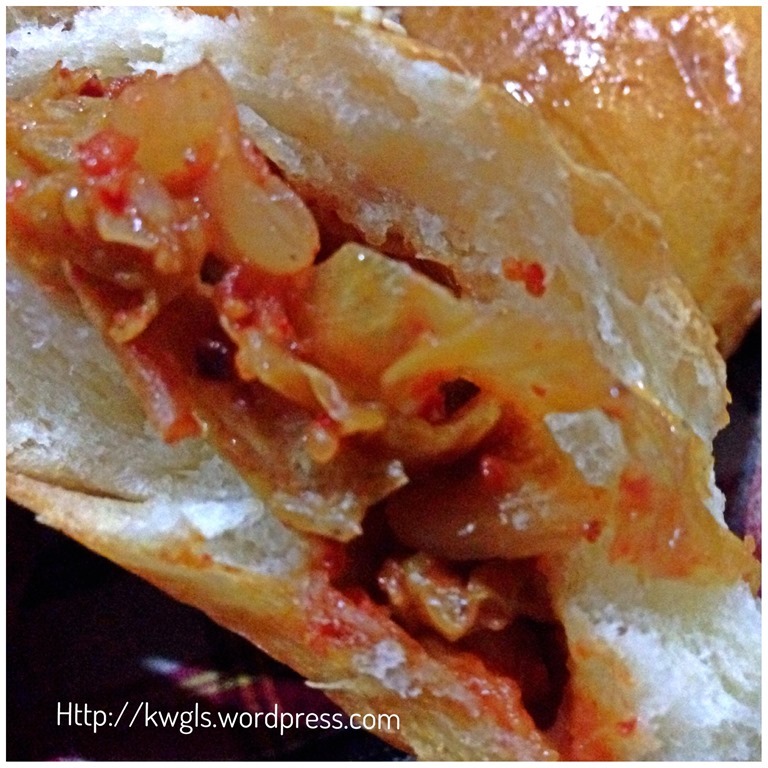 However, realizing that some readers may not be able to get Kimchee or may not fancy Kimchee buns, this post also introduce another common type of common filling, the sweet roast pork fillings. Roast pork can easily be substituted with Chinese Barbecue pork if desired. 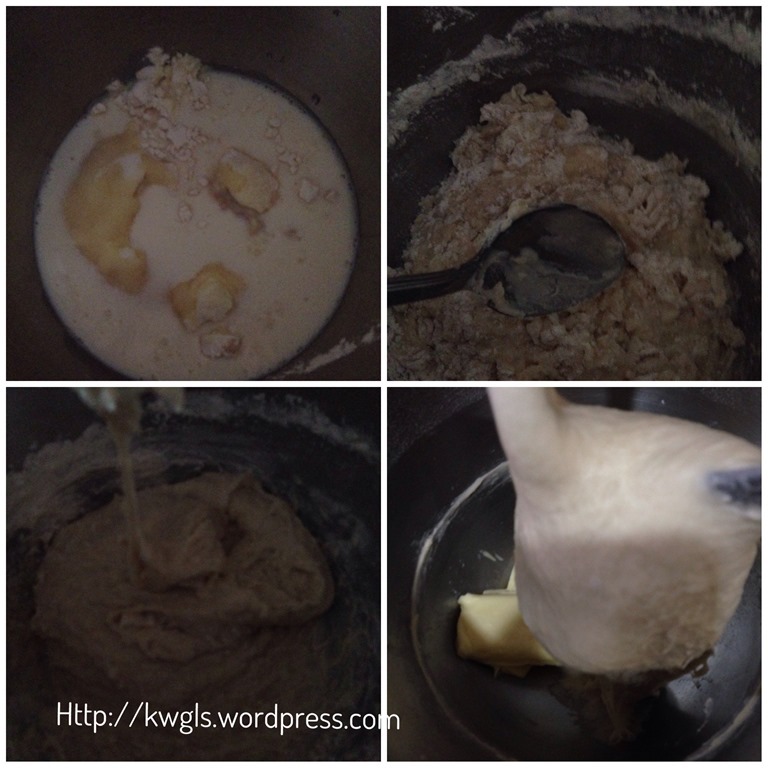 As I do not have any have any bread machine at home, however, therefore, I have prepared this using a cake mixer. If you have a bread machine, you can use the bread machine to make the dough. Add the softened butter and continue kneading at medium high-speed for about 20-30 minutes or when the dough did not stick to the wall of your mixing bowl and do not break when you pull the dough. If the dough is too sticky, it is okay to add one to two tablespoons of flour gradually until it is not overly sticky before the machine kneading starts. Take the dough out, punch into the dough to let any trapped air escaped. 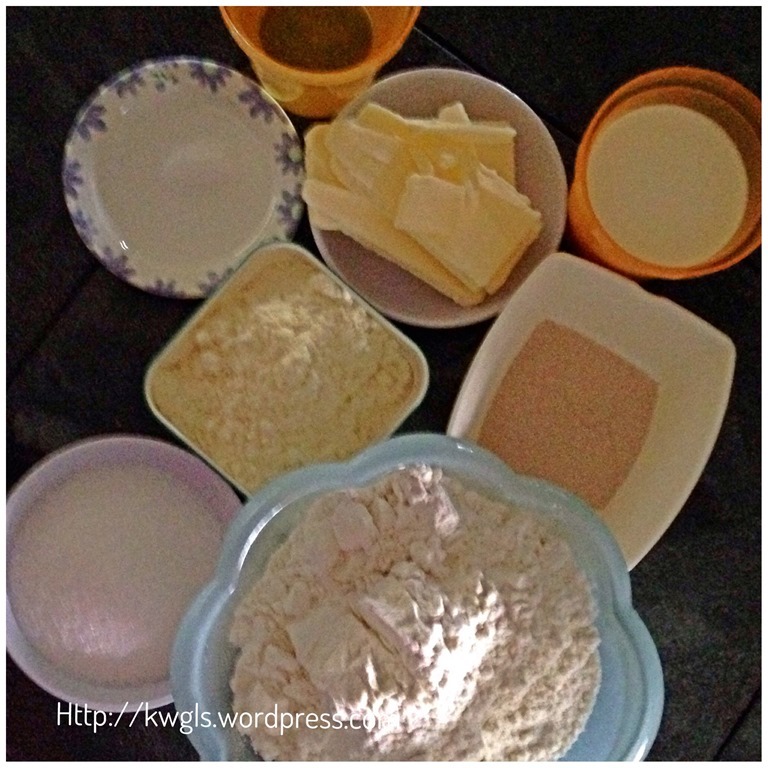 Knead for one minute and divide into 8-10 equal size round ball. Some sesame seeds for decoration. 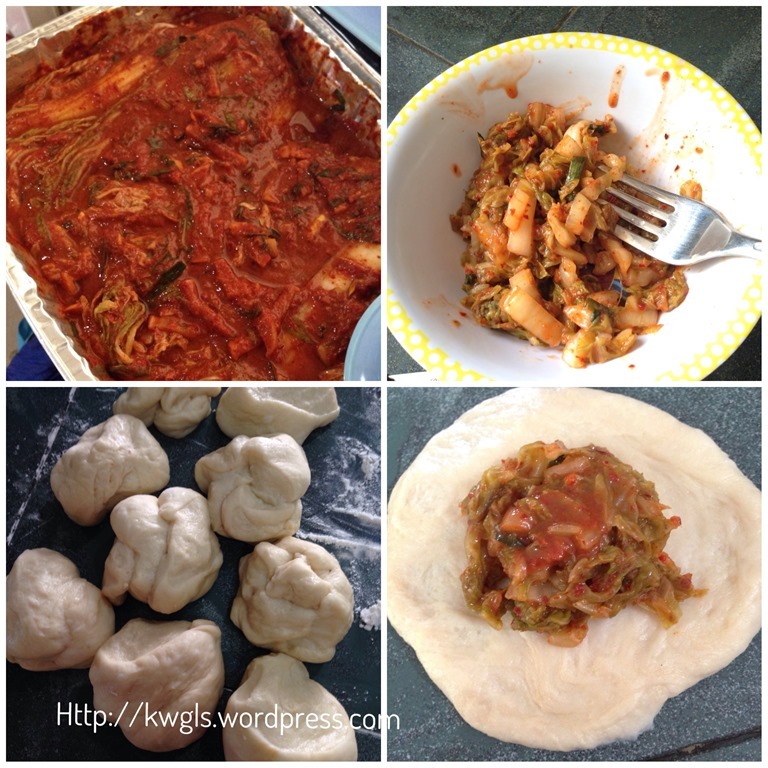 Cut the kimchee into small chunks .Take one portion of the dough, use the roller pin or hand to flatten the dough. 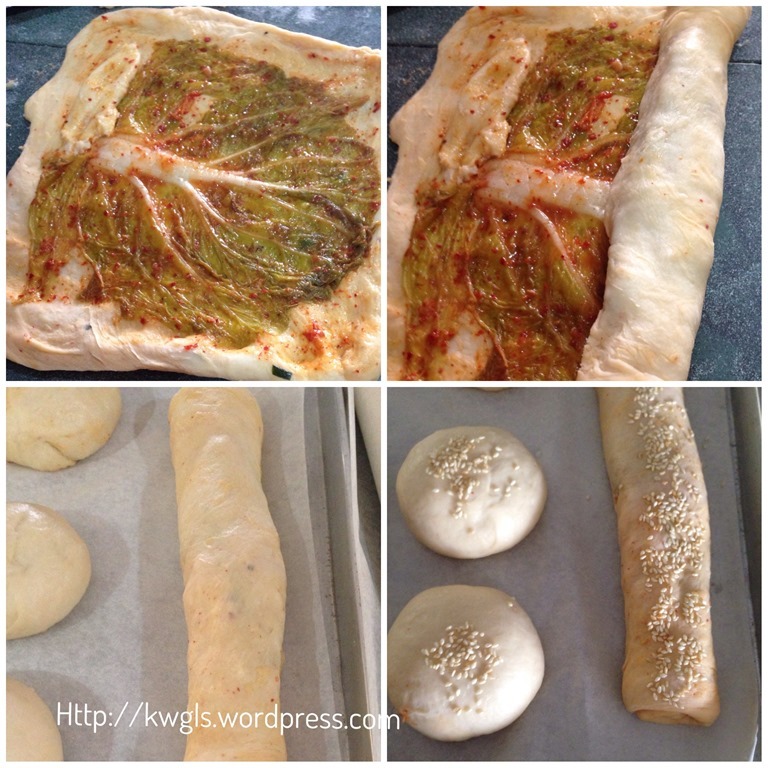 Put 1-2 tablespoons of kimchee on top of the dough. 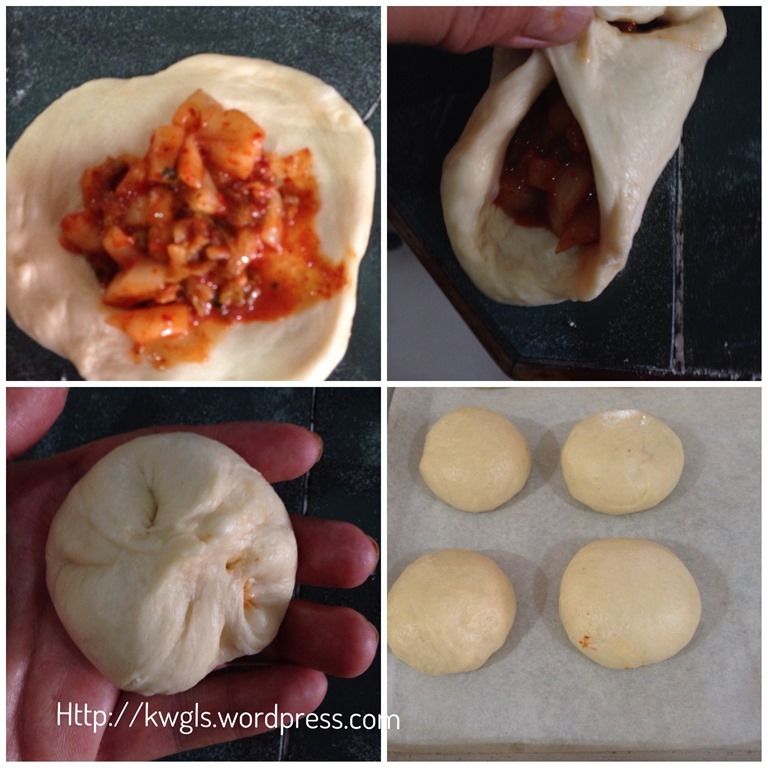 Wrap the dough around the kimchee filling ball as even as possible. 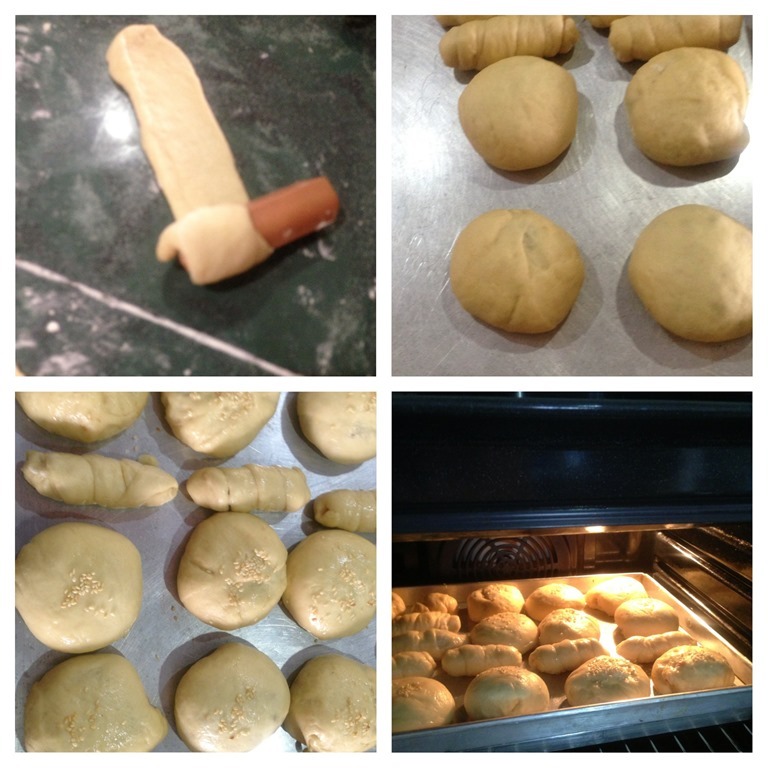 Another way is to prepare some bread rolls. 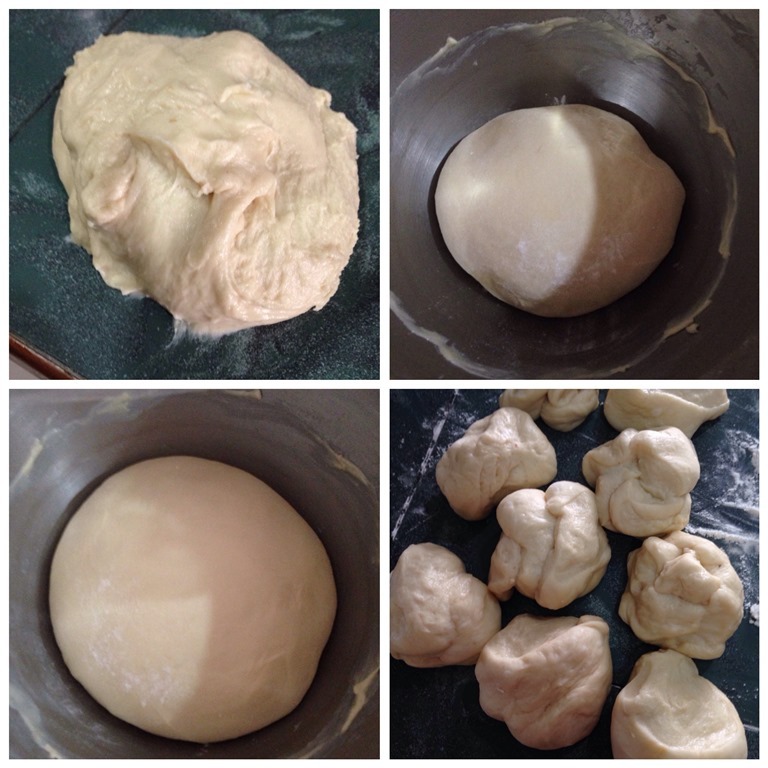 Use 2-3 portions of dough, knead until it become a ball. use a rolling pin to flatten it into a flat rectangular piece of dough of about 1 cm thick. Put some kimchee (or this illustration, I have put in some sausage as my kids love sausages) on top of flat doll, Roll the dough and sprinkle some sesame seeds on top of the dough. Put it in a baking tray and cover with the same damp cloth. Let it proof for another 30 minutes or when balls were almost double in size. Sprinkle with some sesame seeds if desired. Egg wash – Crack one egg yolk and mixed with 3 teaspoons of water and 2 drops of oil, slightly beat and sift into a small box, use the brush to brush on top of the surface. 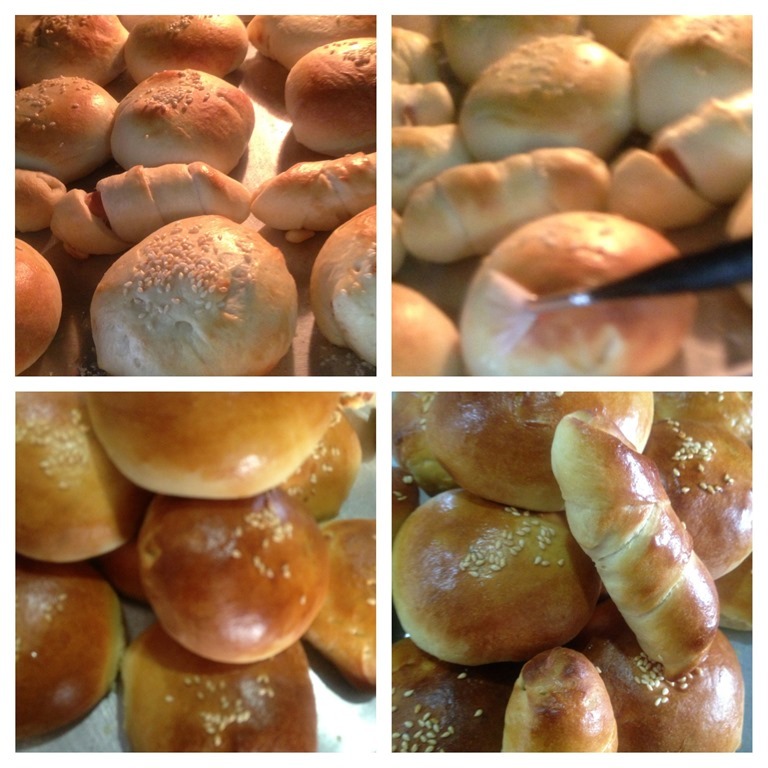 The purpose is to let the buns looks shinny and golden brown. On a big frying pan, put cooking oil and fried the big onion until the fragrance starts to permeate the house。 Add roast pork or barbecue pork, stir fry for 1-2 minutes. 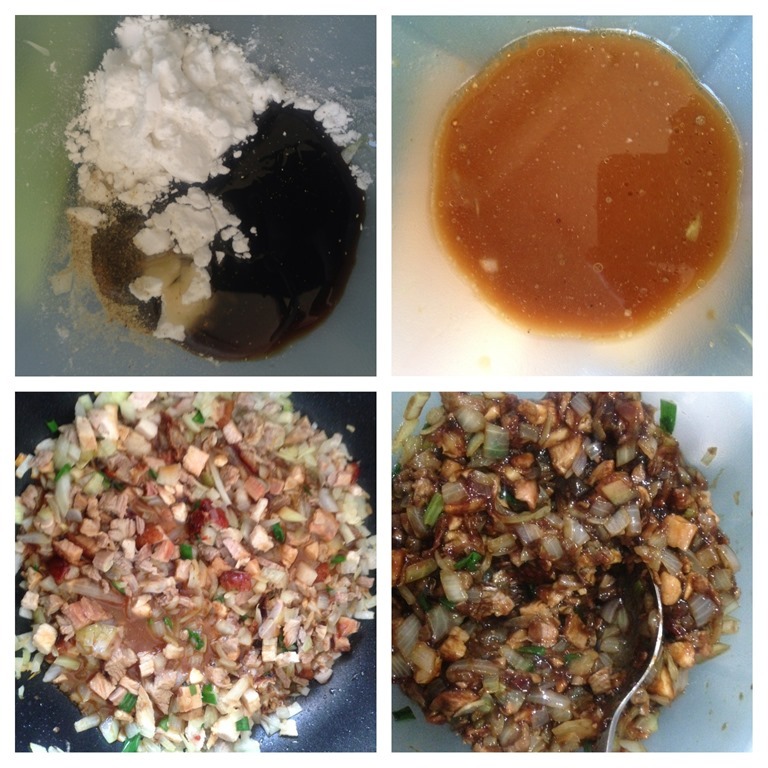 Add oyster sauce, sugar, and other seasonings (such as salt, light soya sauce, dark soya sauce etc.) and follow by corn starch. Stir fry until well mix and resemble a sticky meat paste. Let it cool and set aside for later use. 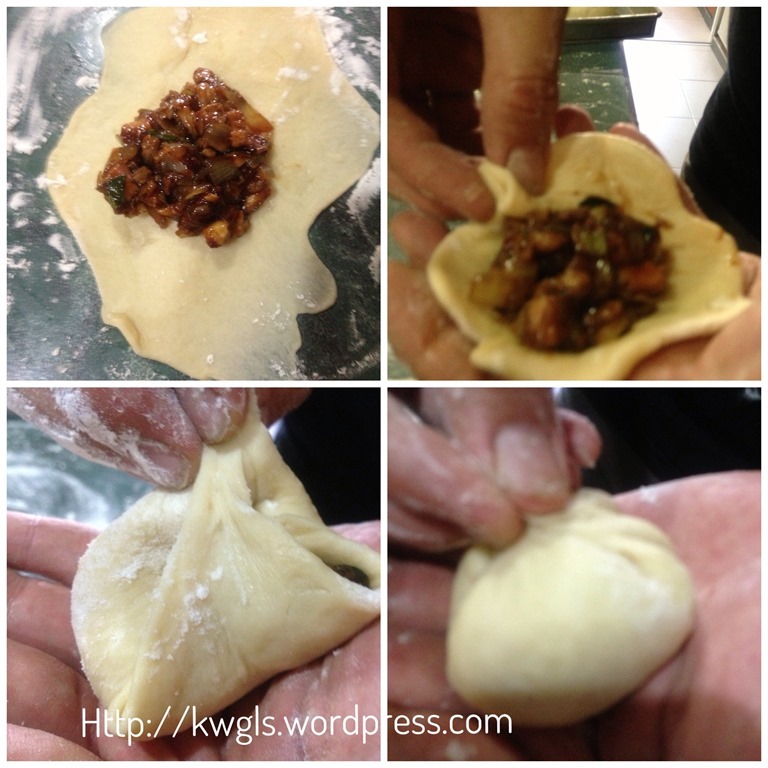 Take one portion of the dough, use the roller pin or hand to flatten the dough. Put 1-2 tablespoons of fillings on top of the dough.,wrap it and ensure that there are no holes that allow the fillings to leak out. If you have extra dough, you can just wrap some dough around the sausage and become sausage buns. Let it proof for another 30 minutes or when balls were almost double in size. Sprinkle with some sesame seeds if desired. 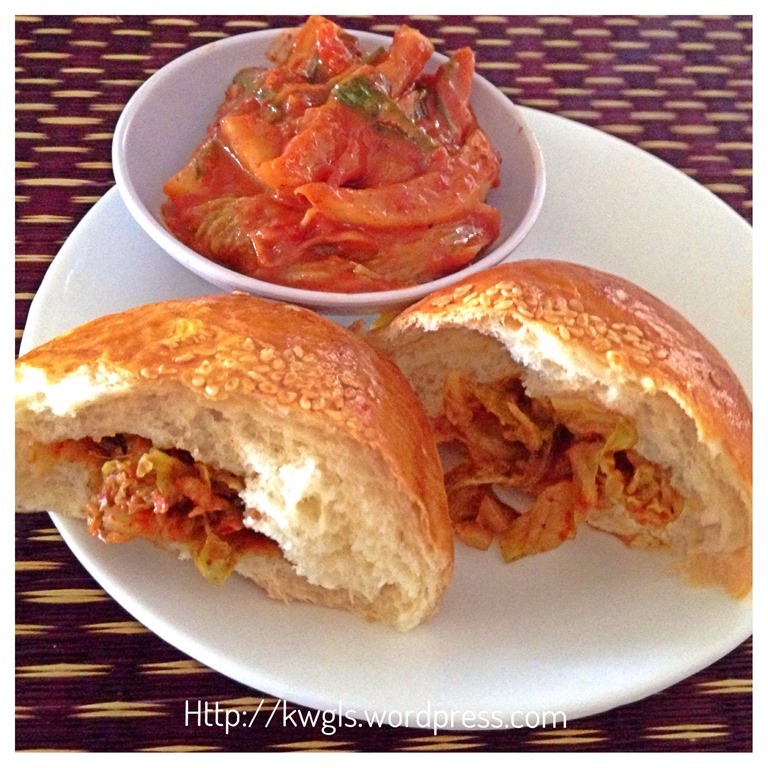 If you are not fancy of Kimchee buns, you can try to make the roast pork or barbecue pork buns. Kimchee buns are sour and spicy yet roast pork buns are both sweet and savoury. Depending on your taste buds, I am sure you can find one that is suits your family’s taste buds. If Kimchee buns and roast pork buns are not your cups of tea, you can try some butter buns, polo buns or Mexican coffee buns by clicking on the links. 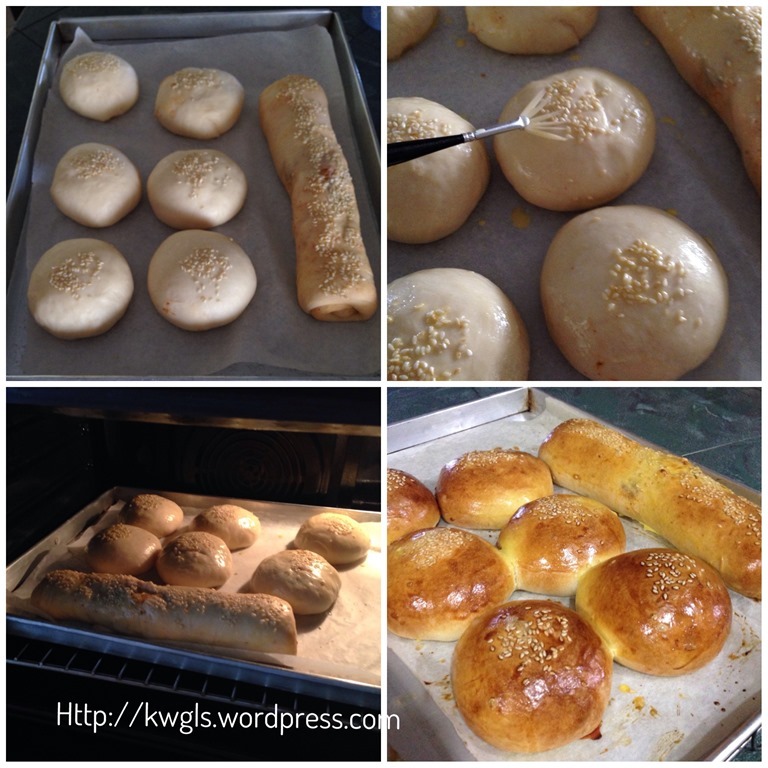 This entry was posted in Cakes and cookies, Food Preparation Series and tagged 8, asian soft buns, breakfast buns, butter buns, chinese barbecue pork buns, Guaishushu, kimchee buns, postaday, roast pork buns. Bookmark the permalink. 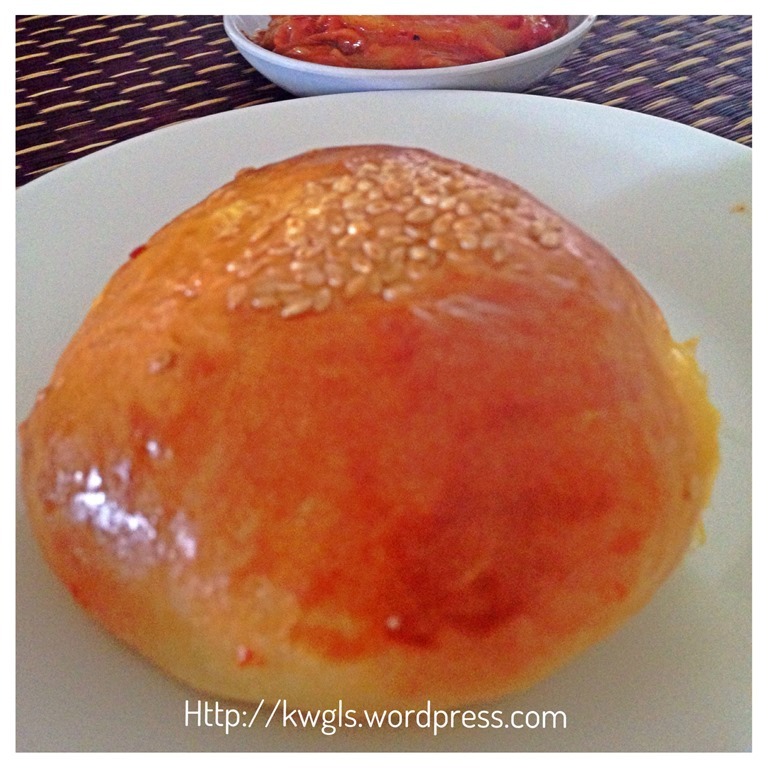 Kenneth, the asian soft buns sound wonderful and then adding the roast pork!! 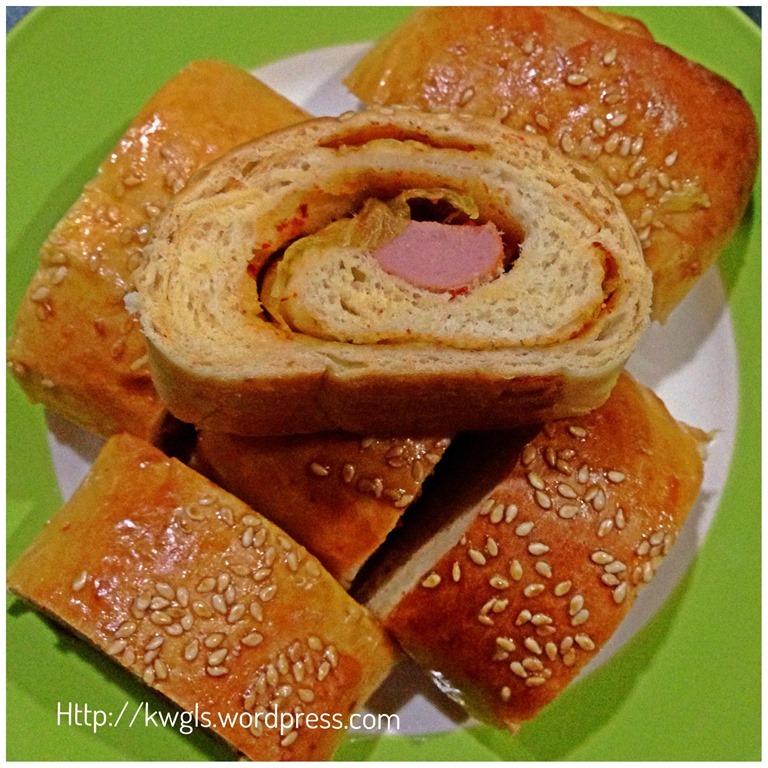 Who could resist this – homemade rolls & BBQ pork. As always, thank you for co-hosting and sharing on the Four Seasons Blog Hop! Wow, they look incredible. Nice work!